How The Pentagon Plans To Spend That Extra $61 Billion : Parallels With the increase, Congress boosted the overall military budget to $700 billion this year. The challenge: How to spend all that extra money before the fiscal year ends in September? Defense Secretary Jim Mattis speaks at the Pentagon Monday. The military received a big boost in funding last week, raising the overall budget to $700 billion this year. Congress was in a generous mood when it passed a spending bill last week, giving the military at minimum an additional $61 billion and boosting its overall budget to $700 billion this year. For some perspective, that $61 billion increase matches or even surpasses Russia's entire military budget each year. It's more than the Trump administration originally requested. It rivals two big spending surges during President George W. Bush's administration, in 2003 and 2008, which went to fund the Iraq War. 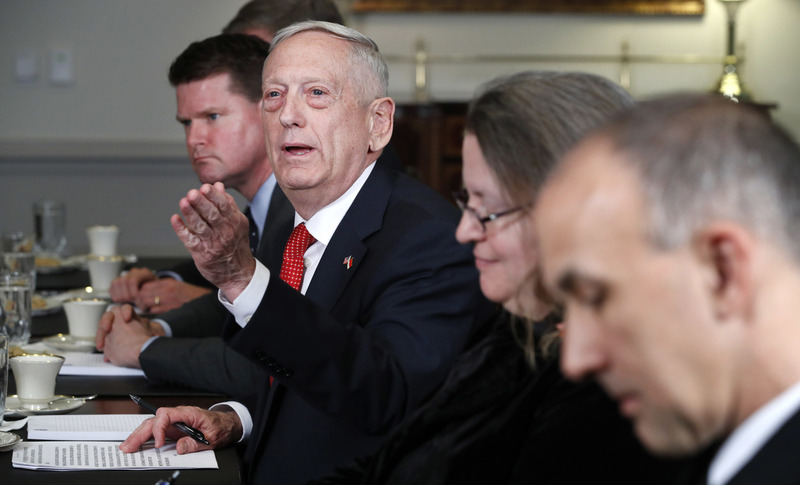 "Today, we receive the largest military budget in history, reversing many years of decline and unpredictable funding," Defense Secretary Jim Mattis said Friday as he appeared with President Trump. "Now it's our responsibility in the military to spend every dollar wisely." Todd Harrison, who tracks military spending at the Center for Strategic and International Studies, notes that the military has just six months to spend this extra money before the fiscal year ends in September. So can the military do it? "There's one thing the Department of Defense is good at — it's spending money quickly," said Harrison. "I am fully confident they'll be able to spend the money before it expires." To help, Congress is letting the military spend a bigger chunk in the final two months of the fiscal year than is normally allowed (25 percent rather than the usual 20 percent). The Pentagon and its many supporters in Congress say this money is badly needed because budget constraints imposed under a 2011 budget deal have steadily eroded military readiness. Vice President Pence addresses U.S. military personnel in front of an Air Force F-35 fighter at U.S. Yokota Air Base, on the outskirts of Tokyo, on Feb. 8. 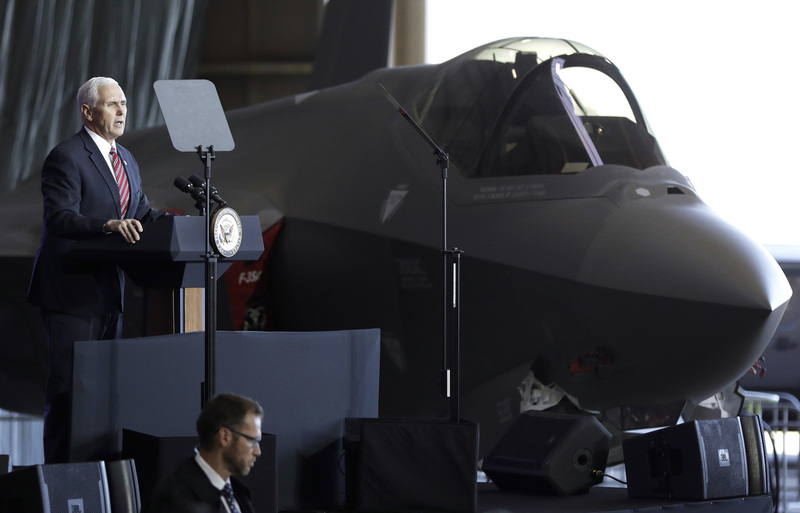 The military will be buying an additional 90 F-35s this year; the aircraft is its most modern — and most expensive — fighter jet. "The first job of the federal government is to defend the country," said Rep. Mac Thornberry, the Texas Republican who heads the House Armed Services Committee. "We're doing that on about 15 percent of the federal budget. But we have cut too much in the last eight years and we have to make up for some of that ground that's been lost. "As big as this year's defense budget looks, it's not enough to fix the problems. But it is enough to start to turn the corner to fix the problems," he added. The additional money will help the Navy buy 14 new ships. The Air Force is getting 90 of its most advanced fighter jets, the F-35. The Army will receive dozens of new helicopters. Got $1.6 Billion to start Wall on Southern Border, rest will be forthcoming. Most importantly, got $700 Billion to rebuild our Military, $716 Billion next year...most ever. Had to waste money on Dem giveaways in order to take care of military pay increase and new equipment. Across the military, troops will get a 2.4 percent pay hike, compared with 1.9 percent for civilian employees of the federal government. There's also an army of critics who say military spending is too high. But regardless of where one stands on this question, there's a broad consensus that the herky-jerky budget process in recent years makes it very difficult for the military to plan. "If I were the comptroller, I would want a full year, I would want a normal process, I would want less budget uncertainty," said Bob Hale, who was the comptroller of the Defense Department from 2009 to 2014. "By far, the biggest thing that was a thorn in my side was the budget instability, and I don't see it ending," added Hale, who is now at the consulting firm Booz Allen Hamilton and is an adjunct senior fellow at the Center for a New American Security. The budget deal does give the military another increase next year, up to $716 billion. Thornberry believes this will remove some uncertainty and establish a new spending baseline. "The way the Pentagon and many of us in Congress are looking at this is, we've got some catch-up to do these two years," he said. This big hike in military spending has broad support from both Republicans and Democrats, who also approved more for nonmilitary spending as well. Trump threatened to veto the bill, but he reluctantly signed it Friday to avert a government shutdown. Harrison, the budget analyst, says new weapons and health care costs keep rising rapidly. To maintain current levels, he says, the Pentagon needs to spend about 3 percent above inflation every year. "We're going to have to make a decision as a nation about our overall defense strategy and the role of our military," he said. "If you want to maintain the same level of involvement in the world, then you're going to need to fund a larger military." This debate looms as forecasters warn of a federal budget that could start churning out annual deficits of $1 trillion in the near future. Greg Myre is a national security correspondent. Follow him @gregmyre1.